A writer publishes his debut novel. The writer has a toe hold in the literary establishment on both sides of the Canada/US border. The novel has a toe hold on both sides of the noir/sci-fi genre border. The setting of the novel is almost borderless; near-future New York functioning as everyplace and no place, a Gotham or Metropolis, a metaphor for where society has gone wrong. The protagonist is an assassin with a code: one foot on either side of the moral fence. The review is not like the novel. The review has to pick a single side. 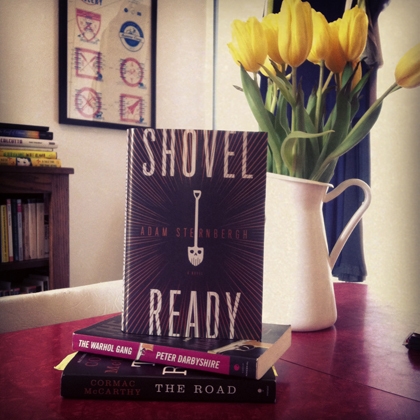 Shovel Ready by Adam Sternbergh. Should you read it? Listen to the segment on CBC Day 6.